Halloween is only a few weeks away and snow is about to hit the ground so light up your home for Halloween with today’s Alaska Rewards offer. 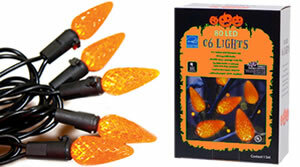 Create a ghoulish ambiance with these Indoor/Outdoor 80 count string C6 LED Orange Bulb Halloween Lights. These lights stretch 80 LED’s an amazing 20 feet and if that isn’t long enough for you buy 44 more and connect them together for a staggering 900 feet of orange bliss. While 900 feet may be more than most people would apply to their homes it’s nice to know that all 900 feet of lights would only consume slightly more power than two 100 watt light bulbs. Plus, these LED’s have an expected average bulb life of 25,000 hours, or just less than 3 years of being on non-stop. These are ideal for commercial or small business Halloween decor, and also the homeowner who sets up a presentation for Halloween. These Indoor/Outdoor commercial quality LED C6 light strings can save up to 90% on energy costs when used to replace traditional incandescent lighting. So spruce up your abode this year with a little festive color at the usual Alaska Reward pricing of 50% off retail! Limit 5 per person. Must pickup lights by Nov 1st and can start picking up as early as deals end.